Evoqua Water Technologies worked closely with United Utilities and its contractor KMI Plus to identify the right technologies to meet the site’s regulatory and capacity challenges, as well as provide a cost effective and sustainable solution. Critically, the project was required to not involve civil works and use the existing building on Clay Lane, which meant that the new membrane plant needed to be compact. The closure of United Utilities’ Haweswater Aqueduct for scheduled maintenance also placed significant time constraints on the project, as it meant the site would need to be working at full capacity by the time of the closure to prevent any disruption to local supply. At the heart of the redevelopment was Evoqua’s MEMCOR UF membrane system, a pressurized, pre-engineered membrane system with a modular building block configuration which simplifies design, operation and reduces installation costs. The system incorporates automated processes, including backwashing to remove built-up solids from membrane surfaces at regular, operator-adjustable intervals, as well as in-built cleaning and membrane integrity testing to ensure a consistent and efficient operation, regardless of feed quality. The high performance of the MEMCOR UF membrane system is attributed to its vertical hollow fiber membrane configuration, which is sealed at both ends to separate feed side from the filterate side of the membrane module. Fibres are also made with polyvinylidene fluoride (PVDF) polymer which provides optimum strength and durability. 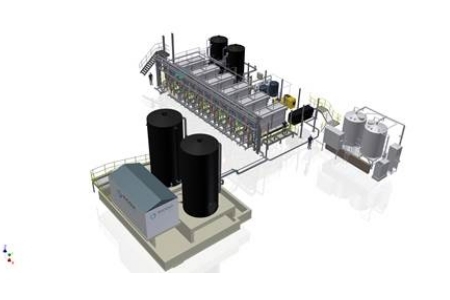 In addition, the system’s unique integrated backwashing, which offers higher feed recovery due to the lower volumes of filtered water being used during the process, offers the plant greater levels of sustainability, as it eliminates the need for separate, energy demanding pumps. The simple design of the MEMCOR UF membrane system also enabled Evoqua Water Technologies to install platforms around the works, making every area of the system easily accessible for operators. Before installing the advanced membrane technology, Evoqua performed a pilot scale trial to demonstrate the full capabilities of the system and ensure it would deliver the quality of water needed to supply the local area.he trial confirmed the system’s ability to adapt to the works’ raw water quality and deliver constant high quality water and the full installation was completed within 14 months. Since its completion, Clay Lane is now capable of treating 16 megalitres of drinking water each day. Clay Lane is now one of six membrane plants supplied by Evoqua operated by United Utilities.